Inventory We are a resale marketplace, not a box office or venue. Ticket prices may exceed face value. This site is not owned by Von Braun Center Arena . 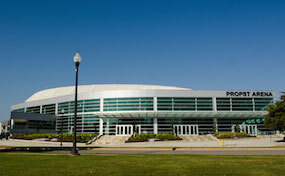 The Von Braun Center Arena has been Huntsville Alabama's premier venue since opening back on March 14, 1975. The facility has undergone many different renovations with the most recent finishing in 2011. The Von Braun Center Arena box office is located on 700 Monroe Street in downtown Huntsville, Alabama. The facility has a maximum seating capacity of 13,750 and was constructed for $15 million. Von Braun Center tickets have included many popular concerts and traveling shows like Disney on Ice, Ringling Brothers Circus, Harlem Globetrotters, and Monster Jam. VonBraunCenter.ArenaHuntsville.com is a privately owned and operated company that specializes in the online retail of all events in the resale secondary market. We are not associated with any venue, performer, or primary box office. Prices on our sites tend to be above face value and can change quickly with demand. To order tickets for all Von Braun Center Arena Huntsville events please call our operators at anytime or follow the steps through checkout.